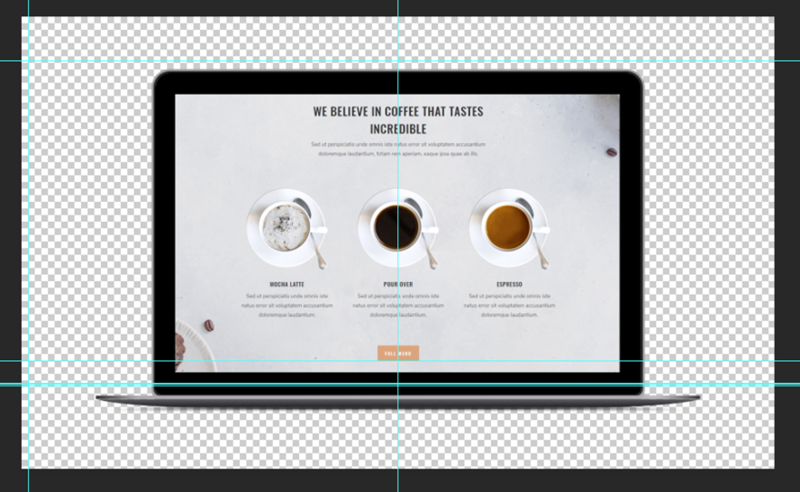 Using mockups is one of the easiest ways to bring a much needed sense of professionalism to your website. There are plenty of sites out there that offer free mockups that you can adjust to your specific needs; we’ve created a list of some of the best ones out there in this post. 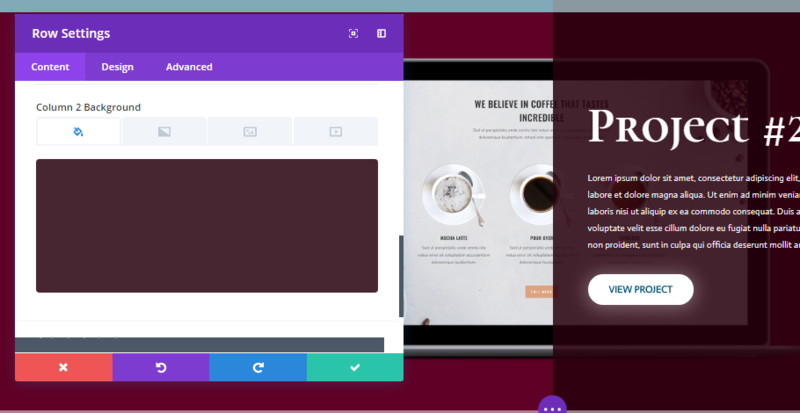 And to help you get started with mockups, we’re going to show you how you can make use of a laptop screen mockup to make your website shine along with some of Divi’s best built-in design options. 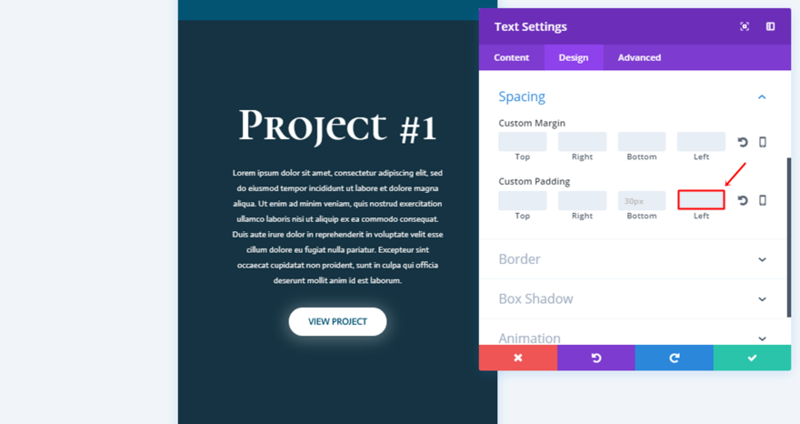 This tutorial is great if you’re building a portfolio page where you showcase previous work. Before we dive into the tutorial, let’s take a look at the result we’ll be achieving. 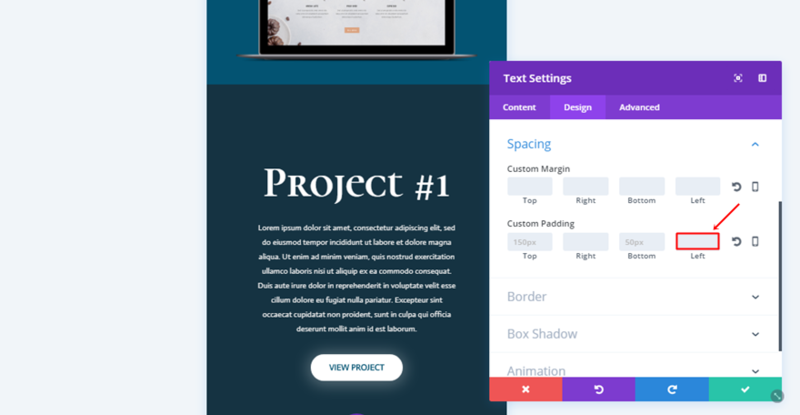 To help you bring this tutorial to a good end, we’re going to provide you with the mockup that is being used in this tutorial for free. 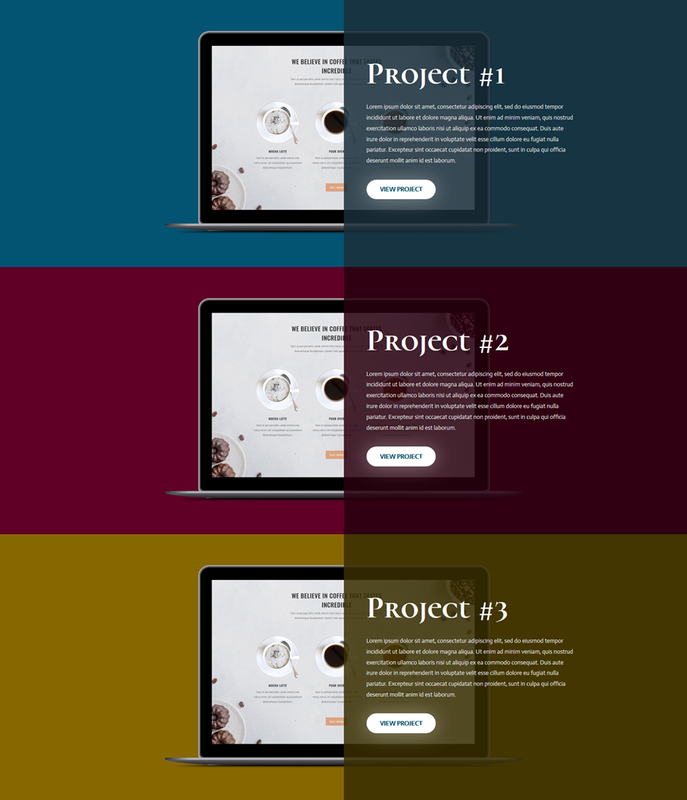 Actually, we’re providing you with two device mockups and several high quality images since the resource we’re (re)sharing is actually from our Design Agency Layout Pack. When you download the image resources below, you can unzip the folder and locate the file called MB-purefront.psd to follow along. 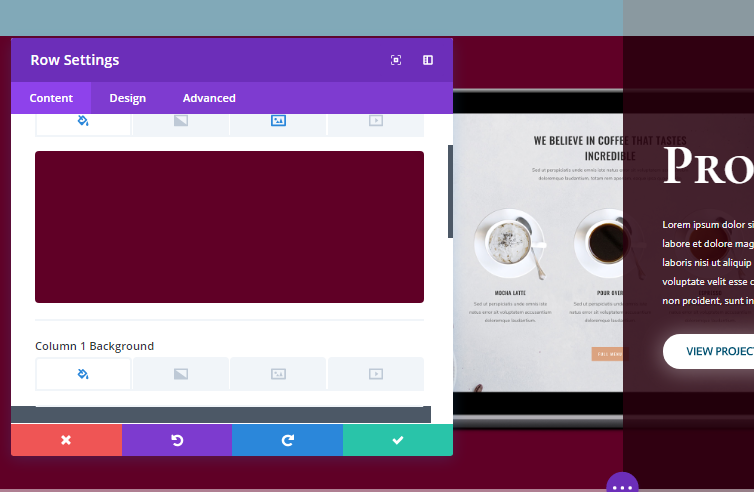 Once you’ve downloaded the mockup, you can change it to your needs. Start by opening the file. You’ll see a new tab appear that contains the image that appears in your screen mockup. 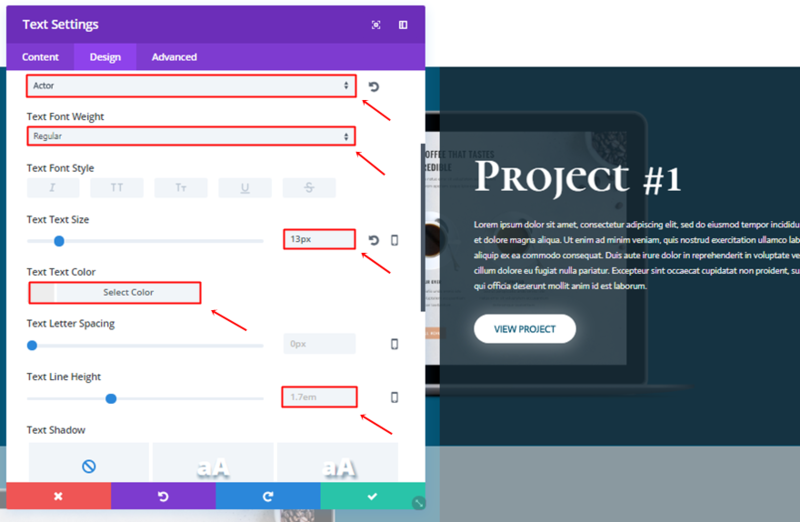 Then, drag the image you want to use for your screen to the tabs. You’ll watch a new tab appear that contains this image. 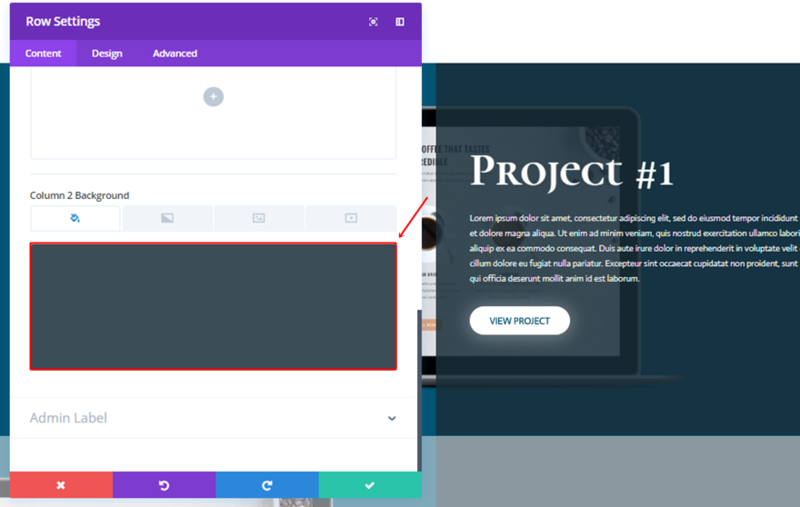 The image that you are using must preferably have a width of ‘1440px’ and a height of ‘900px’ to fit the screen perfectly. Next, copy the image and paste it into the screen layer you have opened. You’ll see that, if you’re using the right width and height, the image will fit perfectly and a new layer will be created. However, if your image is larger than expected, you can always adjust it by using CTRL + T (on Windows) or Command + T (Mac) to make the image fit. 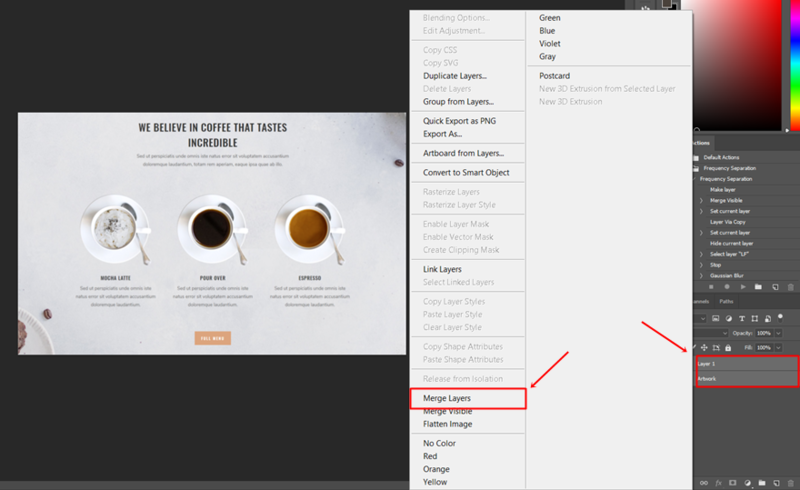 Once you have added the new image to your screen layer, select both layers and merge them. 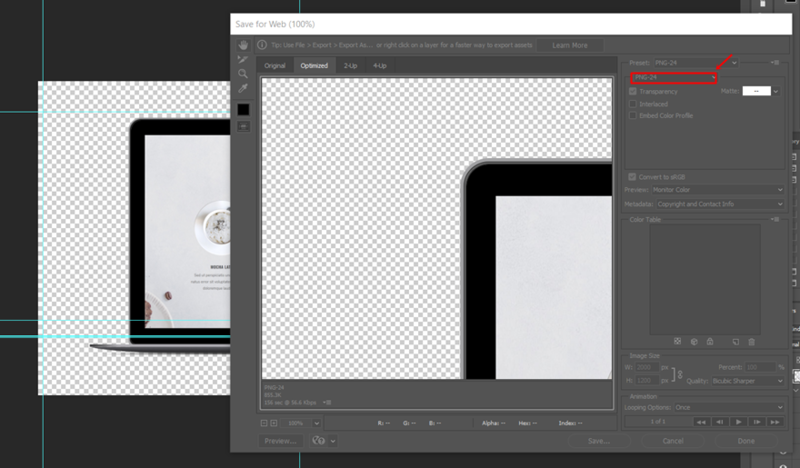 Once the layers are merged, you can go ahead and save the layer by using CTRL + S (on Windows) and Command + S (on Mac). 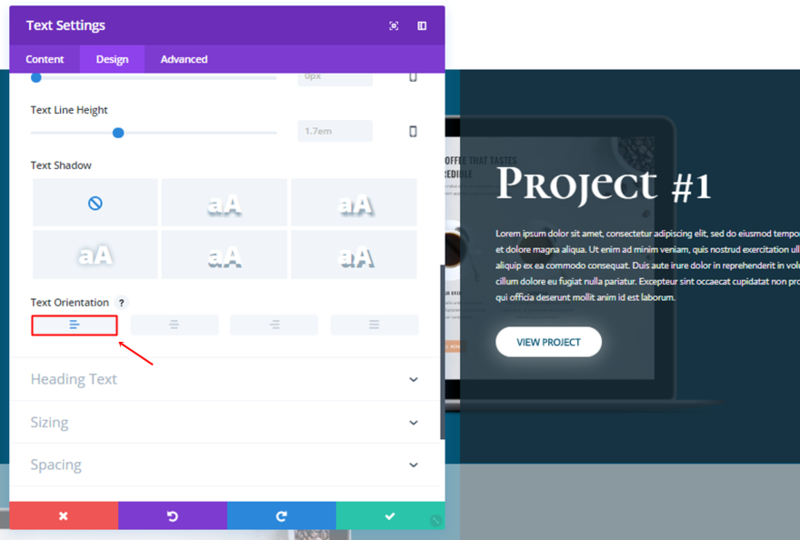 If you, then, return to your mockup, you’ll see that your screen has been changed. You’re now ready to export the image. To do that, go to File > Export > Save for Web > Save as PNG file. Now that we’ve gone through the part where we use Photoshop, it’s time to switch over to Divi. For this tutorial, we’ll only be needing one standard section. 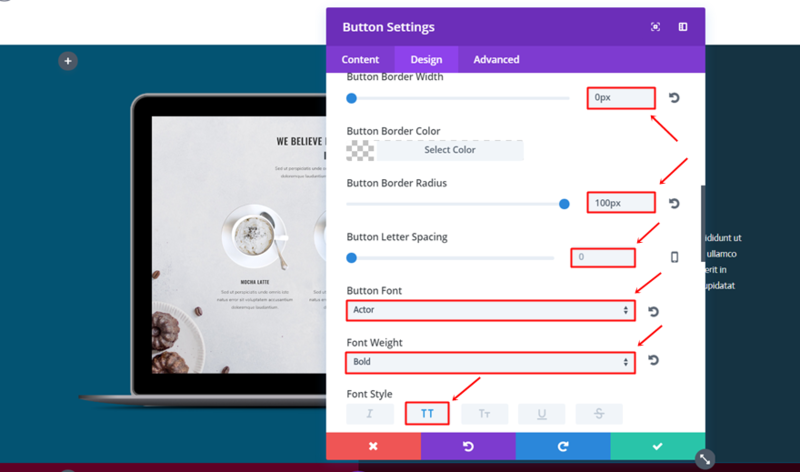 Go ahead, add a new page and create a new standard section without any additional settings. 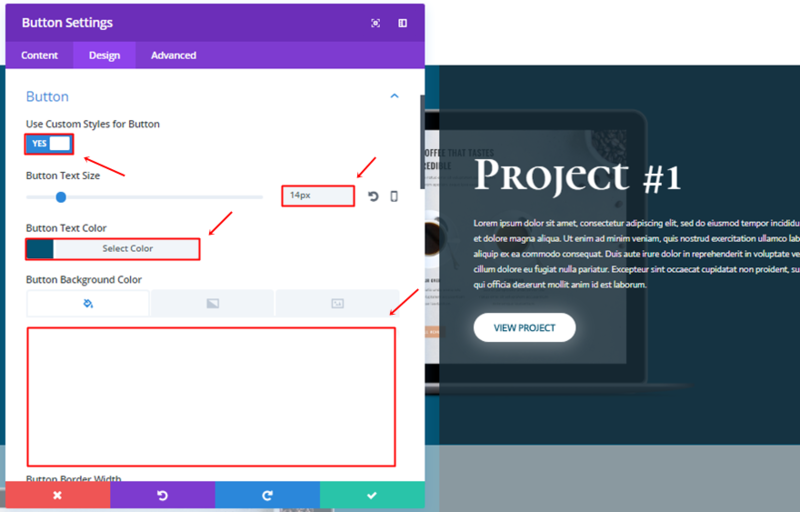 As mentioned before in this post, we’re going to show you how to create a portfolio page with screen mockups that match desktops, tablets and phones. 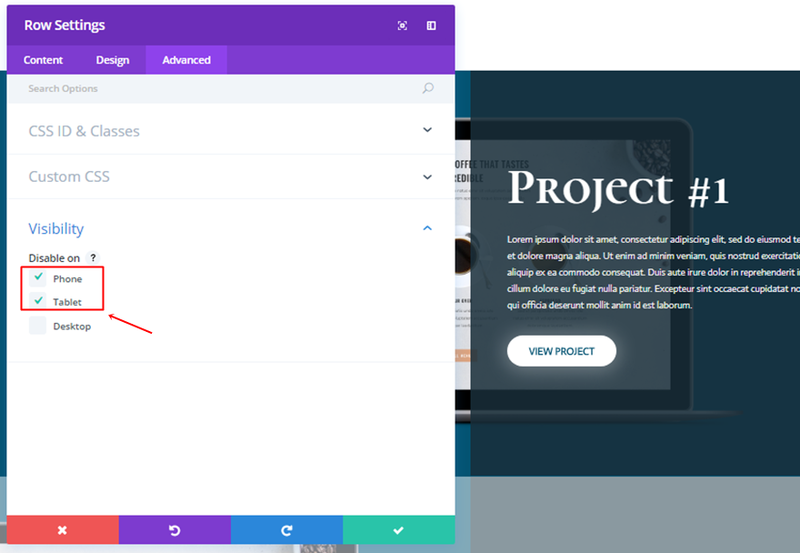 We’ll start with the desktop version, and once you go through this part, you’ll see that creating the mobile version will be a lot easier as we will be reusing most of the desktop’s settings. 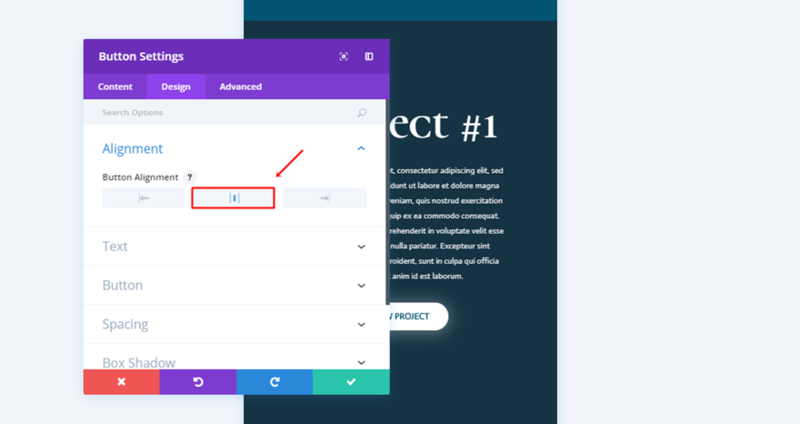 Start by adding a new row to your section with two equal columns. 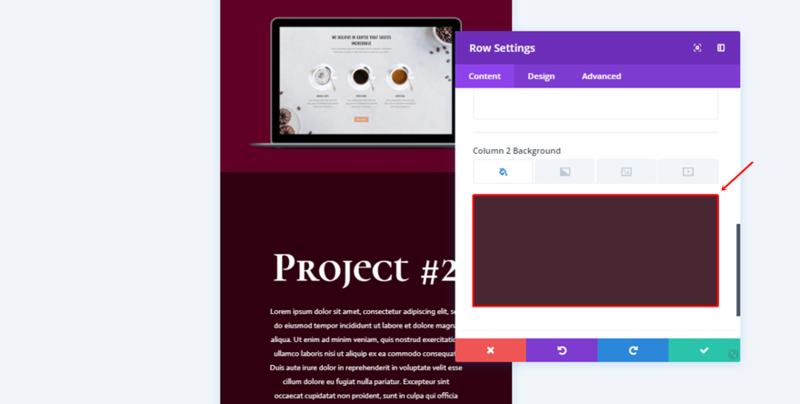 Open the settings of the row and choose ‘#035372’ as the background color. Scroll down the Content tab and use ‘rgba(25,46,58,0.85)’ as the Column 2 Background Color. Moving on, add a custom padding of ‘0px’ to the top and bottom. Lastly, disable the row on phone and tablet. Once you have all the row settings in place, add a first Text Module to the second column of your row. Add another Text Module right below the previous one. Next use a width of ‘67%’ within the Sizing subcategory. Lastly, add a bottom padding of ’30px’ and a left padding of ’50px’. The last module we’ll need to add to this row is the Button Module. 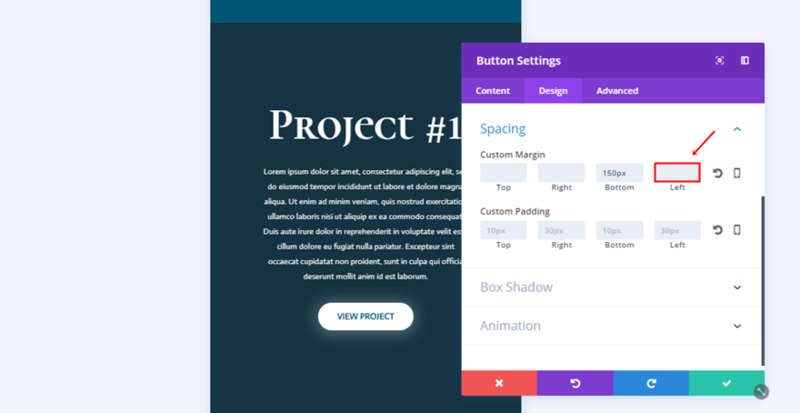 The first thing you will need to do after adding the Button Module is choosing a left Button Alignment. 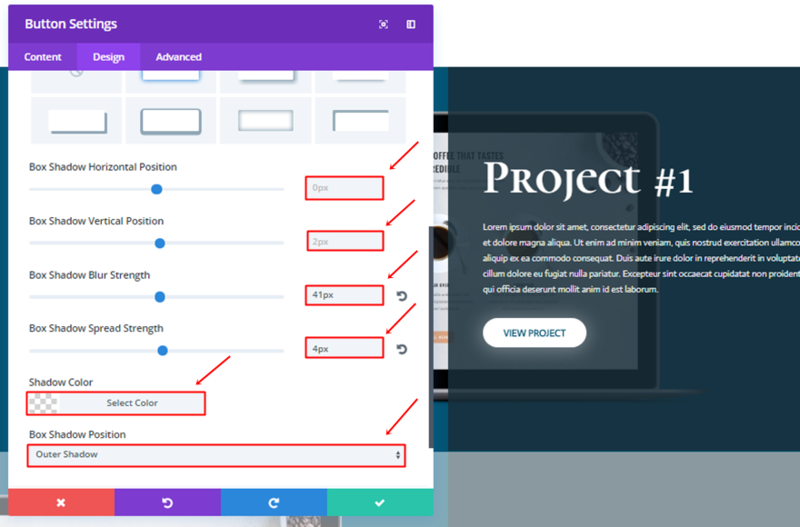 Once you’ve completed all the steps that are mentioned above, you can go ahead and clone the row as many times as you need. You’ll only have to make some slight modification which we’ll mention below. 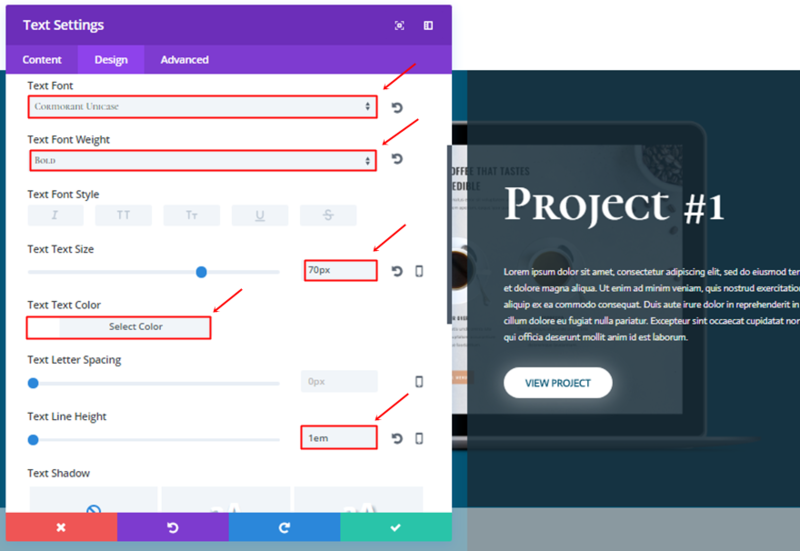 The first thing you will need to do is change the screen mockup and background color of your row. For the example that we’re recreating, we’re using ‘#600026’ for the second row and ‘#876700’ for the third row. The Column 2 Background Color needs to be changed as well. The second row in our example uses ‘rgba(40,0,14,0.85)’ and the third row uses ‘rgba(56,46,0,0.85)’. Now that we’ve created the desktop version, creating the mobile and tablet version will go a lot quicker. Start by cloning the desktop row you’ve created in the previous part of this post. 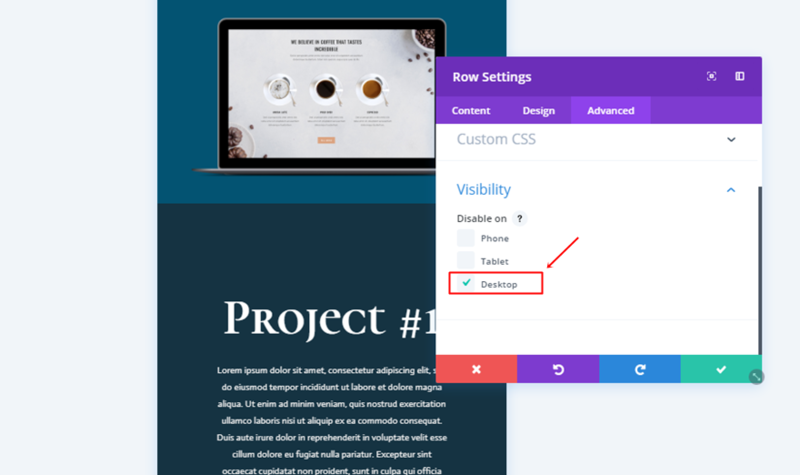 Once you do that, you’ll need to open the row settings and delete the screen mockup in the Background subcategory of the row. Then, you’ll need to go to the Advanced tab and disable the row on desktop, instead of on tablet and phone. Next, go ahead and add an Image Module to the first column of this row. This Image Module will sort of ‘replace’ the row background image that we used in the desktop version. 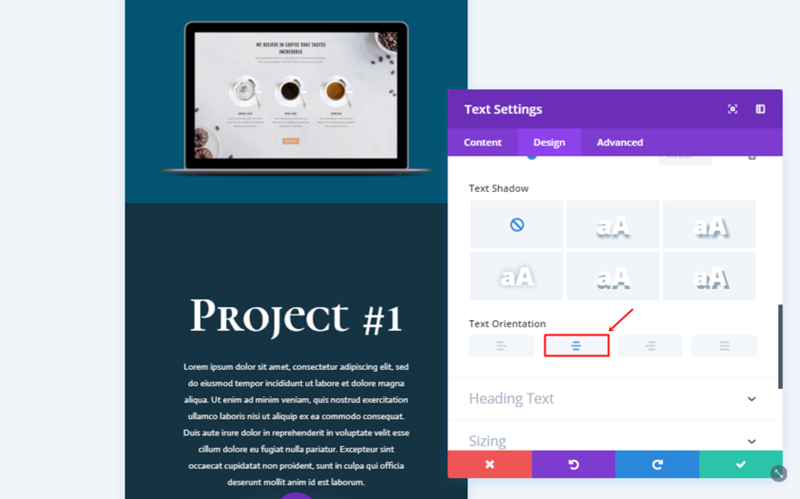 Then, open your Text Module and change the Text Orientation to ‘Center’ in the Text subcategory. And remove the left padding as well. 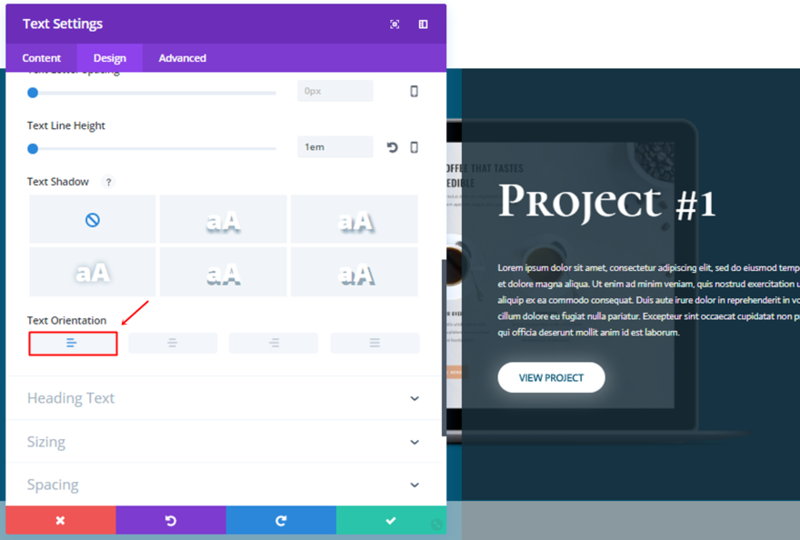 Moving on, open the second Text Module in your second column and put the Text Orientation to ‘Center’. 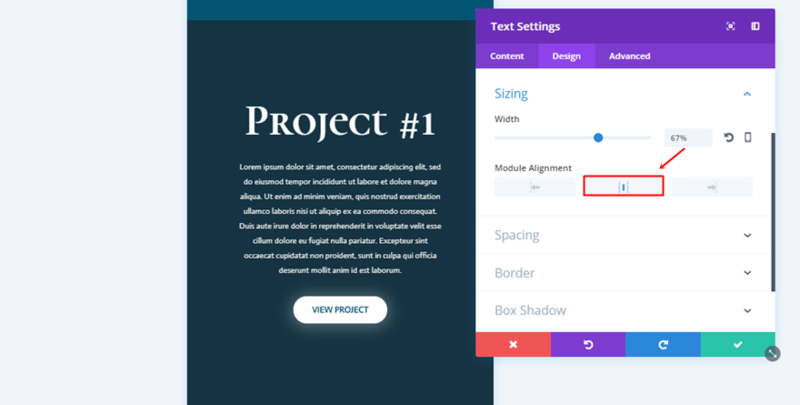 Then, open the Sizing subcategory and choose a center Module Alignment. Lastly, remove the left padding of this Text Module as well. 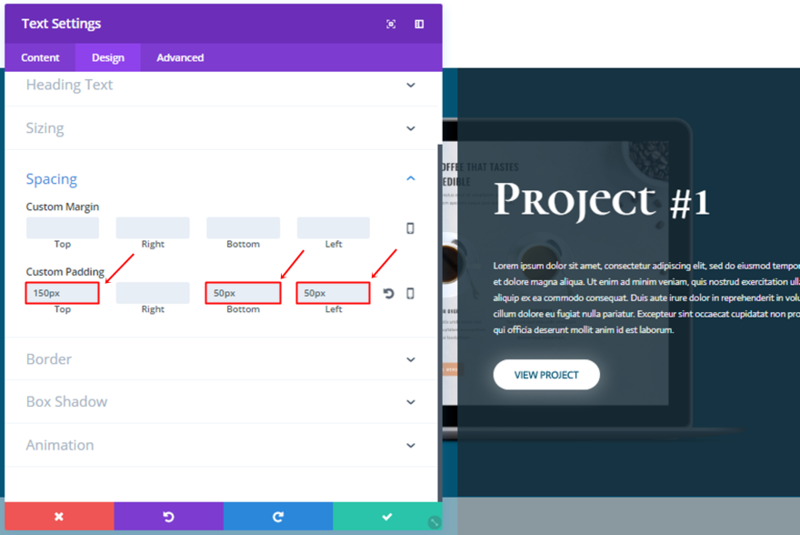 You will also need to change the Button Alignment of your Button Module into ‘Center’. And remove the left margin. 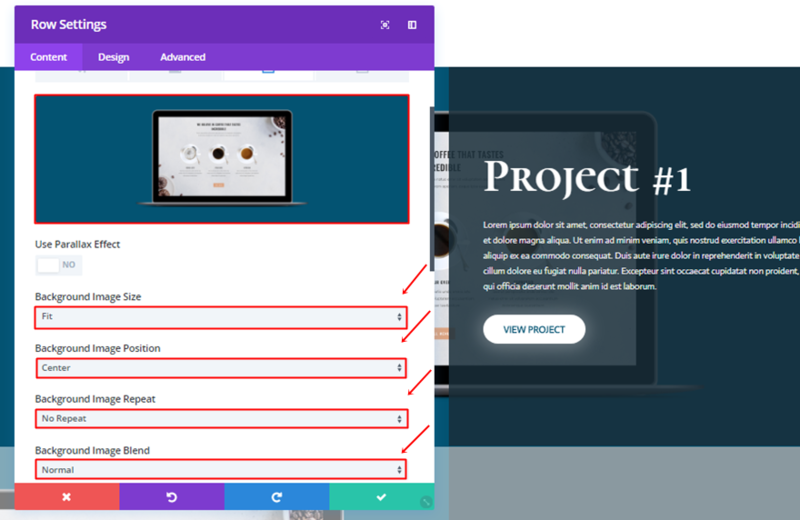 Again, you can clone this mobile version as many times as you need and make some small modification to it. One of those changes is changing the row background color into ‘#600026’ for the second row and ‘#876700’ for the third row in the example. And change the Column 2 Background Color to ‘rgba(40,0,14,0.85)’ for the second row and ‘rgba(56,46,0,0.85)’ for the third row. 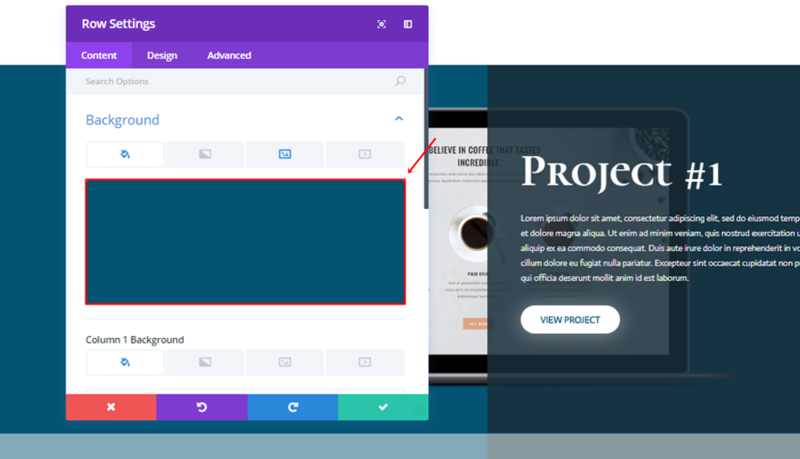 Lastly, you will also need to change the screen mockups in each one of the new versions that you create. Of course, make sure that these are in line with your desktop version. 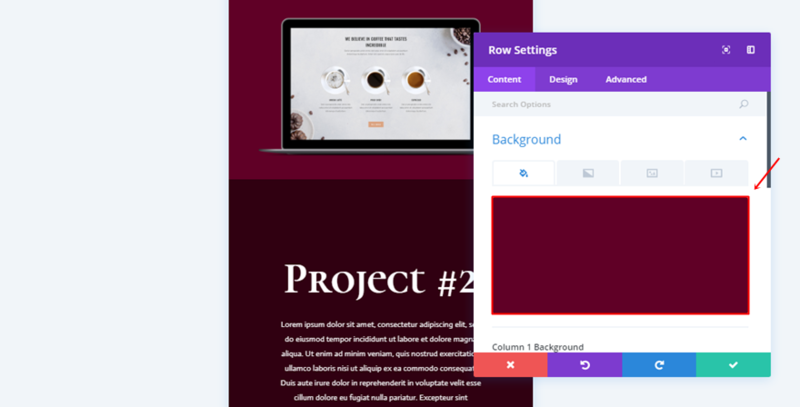 In this post, we’ve shown you how you can creatively use screen mockups along with Divi’s design options to create beautiful results. 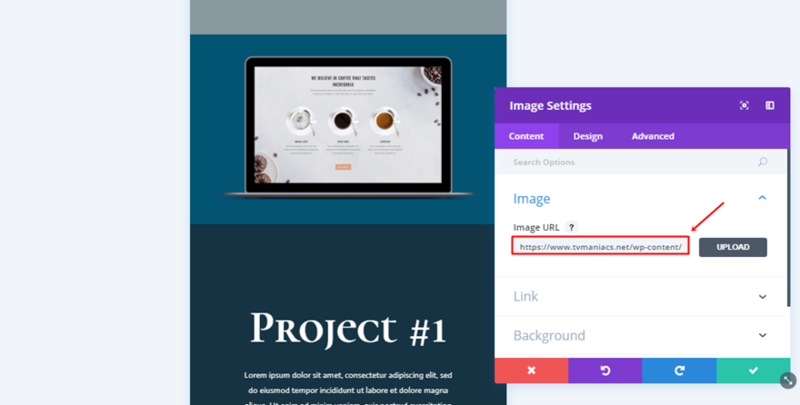 The layout we’ve shown you how to create is ideal for portfolio pages where you showcase previous work to your visitors. If you have any questions or suggestions; make sure you leave a comment in the comment section below. This is another excellent tutorial. Thank you, Donjete and ET, for continuing to provide so many resources for design inspiration! As a question/suggestion for a related technique to explore, I’m curious how one might be able to integrate a slider within the laptop screen; that would allow one to highlight multiple images for each project, and have them scroll beautifully within the laptop screen. Thanks again so much for all your outstanding work! These look lovely. 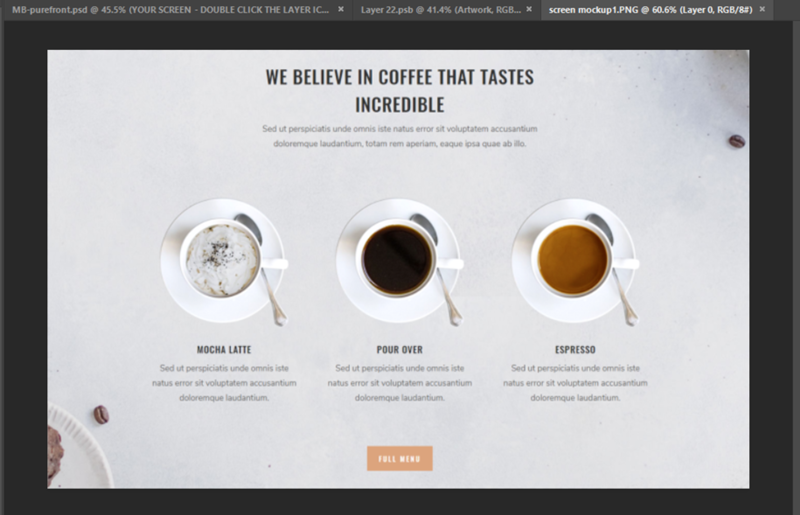 You could also just use a site like placeit.net or smartmockups.com which saves a lot of time photoshopping! Check the links. Just what I need. Thanks. Great instructor/communicator. Easy to follow. Thank you. Love your voice and your easy way to communicate.